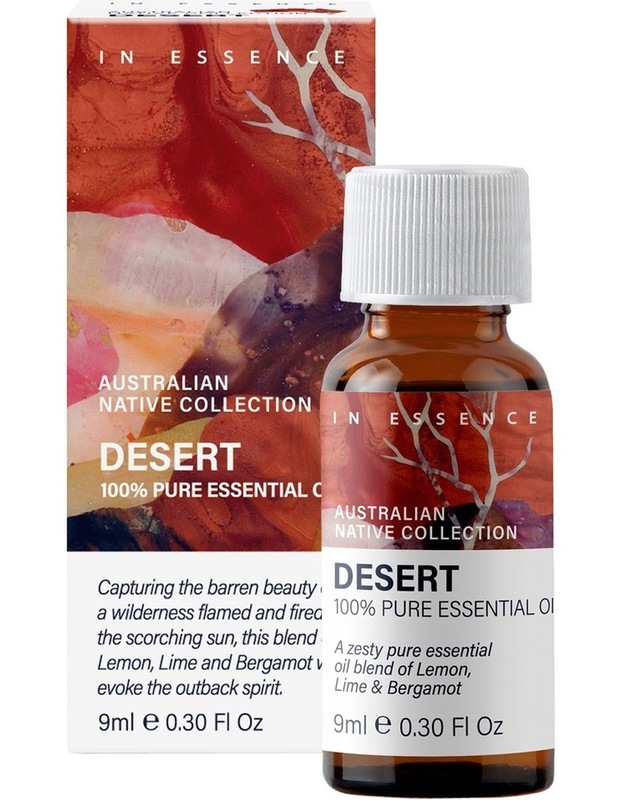 Australian Native Lifestyle Blend Desert 9ml This harmonious blend has a refreshing opening of Lemon, Lime and Bergamot while deep base notes of Sandalwood and Budda Wood add depth Ochre sand dunes smoothed by dust storms recalling a barren wilderness flamed and fired by the scorching sun. METHODS OF USE: VAPORISE: 6 drops to bring pleasure to the senses and release the purity of the Australian landscape into your home. MASSAGE: Combine 3 drops in total to 12 mL massage base oil and massage onto area of discomfort. SPRITZ: 6 drops in 100ml Spritz bottle of water and spray surrounding air avoiding eye areaContains: Citrus Aurantifolia Oil (Lime), Citrus Aurantium Bergamia Peel (Non-Phototoxic Bergamot) Cedrus Atlantica Wood Oil(Cedarwood), Citrus Limon Peel Oil(Australian Lemon), Eremophila Mitchellii Wood Oil (Buddawood), Santalum Spicata Wood oil(Australian Sandalwood), Amyris Balsaifera Wood(Amyris) Not for Internal use. Keep out of reach of children. Seek medical advice if symptoms persist. Store below 30C 9mls Please recycle.